Helping Guide Dogs Victoria put their best paw forward. The saying suggests you can’t teach an old dog new tricks. You can, however, partner with a much-loved institution to develop a new website. That’s exactly what we did recently with Guide Dogs Victoria—a forward-thinking organisation with a proud fifty-year history, and a premier provider of vision support services. We collaborated with the team to bring the Guide Dogs Victoria website into better alignment with the breadth and quality of supports they offer. 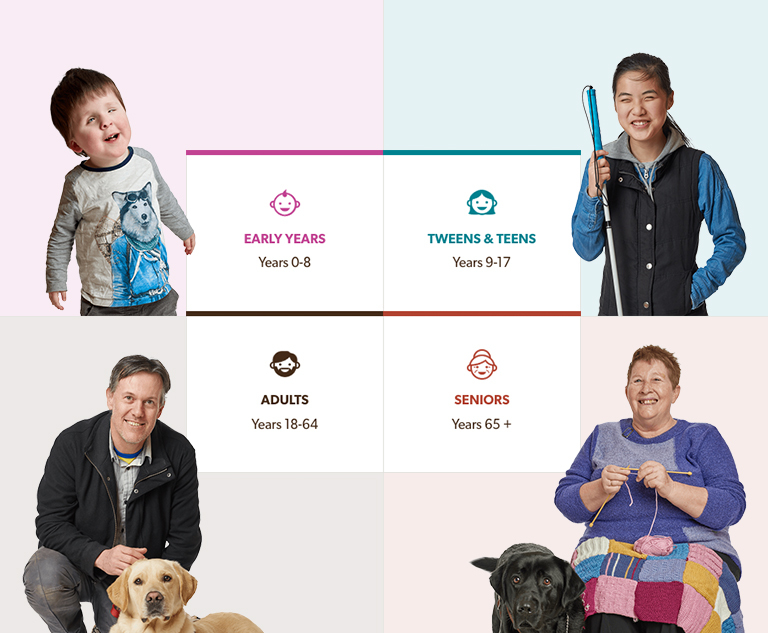 The goals were twofold: ensure Victorians with low vision can better understand and more easily access essential services, and consolidate Guide Dogs Victoria’s status as a much-loved and leading community organisation. While the Guide Dogs themselves are a huge aspect of the organisation’s work, and have been for over 50 years, they’re just one part of a much more comprehensive suite of services: from assistive technology training and peer support programs, through to occupational therapy and travel techniques. When it comes to low vision, one size doesn’t always fit all, and the team at Guide Dogs Victoria offers tailored support for adults, children, teenagers, and family members of all ages. Each audience has changing needs that develop over time. Making matters more complex is the ongoing rollout of the National Disability Insurance Scheme. The NDIS is a federal government reform designed to provide people with greater choice and control over the support they receive. As a result, a key part of the project was to better articulate the range of services Guide Dogs Victoria provide. Plus, with multiple audiences, including people with low vision, schools and community organisations, donors, and volunteers, the site had to offer simple navigation and clearly direct a range of people to achieve their different goals. We figured, if the services are individually designed, why not make the site the same? So we built a website offering unique experiences for each key audience, segmented by age. Regardless of whether you’re a teen, a senior, an adult, or the parent of a young child looking for services, you’ll receive content, services and funding information tailored to meet your specific needs. Visitors are prompted to self-select on the homepage, for a unique experience from that point on. Another key consideration was the presentation of content. Given the various supports, there’s a significant amount of important information on offer. A modular approach to copy and imagery keeps the content engaging, even on long-form pages with detailed program specifics. The modulated grid design also makes for easily configurable information and flexible content hierarchies. If there’s an important seasonal message, campaign or call to action, it’s simple to add multiple types of content blocks anywhere on-page. Accessibility was paramount throughout design and development. Given that the website will be used by many people with low vision, it is WCAG 2.0 compliant, and features scalable text display, high contrast mode, and compatibility with screen readers. We got in touch with a wide range of people throughout the testing process to ensure the site is easy to navigate for everyone involved. Accessible design doesn’t have to mean a compromise on aesthetics, and we worked hard to place equal emphasis on both. The new site features lots of bold, visual content with studio-shot header imagery for a consistent high quality finish. Of course, everyone loves the dogs themselves too, so it was a careful balancing act between showcasing the pups and the people they support. We included a plucky parallax-inspired retriever in the site’s global newsletter sign-up module. And, a similar scroll-triggered effect in all header images to keep things lively at the top and tail of every page. Take a look at the new site to check out all the features, fur, and get the latest from Guide Dogs Victoria. Since 1957, Guide Dogs Victoria has provided vital support for Victorians with low vision or blindness. Today, the organisation's services go beyond the dogs themselves to include a wide range of community initiatives, and training and education programs.